Yosemite kids’ fun never stops in Yosemite National Park, where families go to swim the park’s lakes, raft, bike and hike, spectacular scenery adding a special thrill to the adventure. Kids and families love our multi-sport packages including Yosemite hiking and Merced River rafting. All age levels welcome, no experience required. Book Online. An Indian gaming casino located in northern California, Black Oak Casino offers bowling, live music and a variety of games. Religious retreat, partnering with churches to teach Christian values, summer camps and retreats, beautiful mountain setting. Located on thirty acres of land in Yosemite, Camp Wawona is a beautifully located Christian camp focused on nature. With theatres in Sonora and Columbia, California, the Sierra Repertory Theatre offers live, quality performances. Tour guide for Yosemite National Park from a Native Yosemite Indian point of view. Chief tour guide Yosemitebear has lived in the Yosemite Indian culture for 25 years. Things to do in Yosemite for kids are abundant, and kids as well as adults need active vacations! At Yosemite National Park and the surrounding areas of the Sierra Nevada Mountains, there is a lot more to a vacation than just admiring the scenery. You will find numerous activities for the whole family, especially in the warm summer months. Yosemite kids’ activities certainly should include biking on any of the 12 miles of easy trails. They take you to some very beautiful spots within the park, mainly around Yosemite Valley. Throw a line in any of Yosemite’s lakes, streams or rivers to pull out some healthy trout. Try the Merced River, Hetch Hetchy Reservoir or Frog Creek. 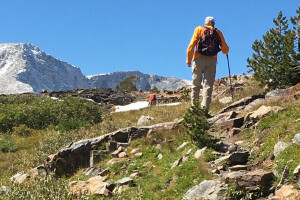 There are miles and miles of hiking trails within Yosemite, many of a good length for kids. It’s great for the little ones to get out in the backcountry and experience nature up close. Trails of less than a mile take you to incredible waterfalls and other beautiful sights. There are three riding stables within the park where you can get some guided horseback rides. These are in Yosemite Valley, in Wawona and at Tuolumne Meadows. The Merced River is ideal for rafting, either a calm float or some whitewater to lend some excitement to the trip. The best place is between the Stoneman Bridge close to Curry Village and the Sentinel Beach area. A unique way to see the park is to take a scenic flight over the gorgeous mountains. Aerial tours are very popular with families visiting Yosemite. Most of Yosemite’s lakes are open to swimmers. Kids love to swim in mountain lakes, but just be aware: the water is cold! 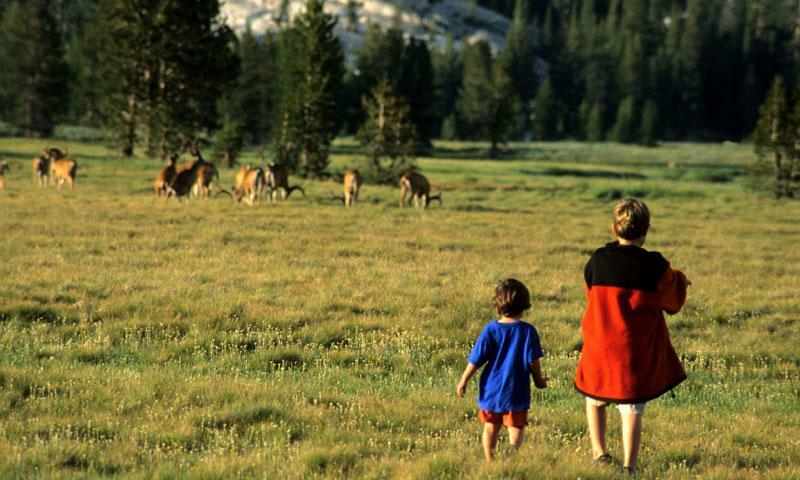 Visiting Yosemite with kids means you should look into the on-going park programs. Junior Ranger Programs are a popular activity with those kids ages 7 to 13. Participants earn a Junior Ranger badge, which they’ll treasure for years to come. There are also ranger-led walks, ranger talks and many evening programs. Yosemite Valley is a popular destination within the park, as not only are there incredible views of all the park’s wonders, but it’s a bustling hub of activity. Hiking the trails, stopping to tour the visitor center and visiting the Nature Center all provide a lot of interesting things to do and see. This viewpoint above Yosemite Valley offers incredible views of Half Dome, Yosemite Falls and other points of interest in the Sierra Nevada landscape. There are also a number of hiking trails and meadows along the road on your way to the overlook. Yosemite kids’ travel adventures wouldn’t be complete without a visit to the park’s amazing Giant Sequoia groves. Be sure to see the largest grove, Mariposa Grove only two miles from the park’s south entrance. The other two, the Tuolumne and Merced Groves, are closer to the Valley, near Crane Flat. Nothing can compare to walking among these massive Giant Sequoia trees. This visitor center in Yosemite Village offers exhibits, maps, books and audiovisual programs that give the visitor a great introduction to the splendor that is Yosemite. The Nature Center at Happy Isles lets you and the kids explore a few short trails, each one devoted to a different ecological landscape. There are a number of interactive displays that fascinate those of all ages. Admission is free! Stopping on the east side of this tunnel into the valley provides panoramic views of Yosemite’s best attractions. It’s a popular stop for photographs of the kids with Yosemite Valley as a backdrop. This huge dam allowed Hetch Hetchy Valley to fill with what is now the Hetch Hetchy Reservoir. You can hike over the dam and enjoy a bit of history as you read the interpretive signs along the way. This lovely beach on the Merced River offers a place to relax, enjoy the sun and take a dip in the water. Right next to the beach is the Swinging Bridge with views of El Capitan, the Three Brothers and Columbia Rock. Kids love the Yosemite Museum and Indian Village. It’s the perfect family destination in Yosemite Valley, where everyone will enjoy learning of the native Paiute and Miwok Indians who lived in the Valley. Besides enjoying the wagon rides, the kids love to see the historic structures on display, including a covered bridge, John Muir’s cabin and more. Camp Wawona is an area within Yosemite National Park dedicated to kids summer camps, conferences, family reunions and church retreats. Tuolumne Trails is a camp for children with special needs.